Today I have a real treat lined up for you. 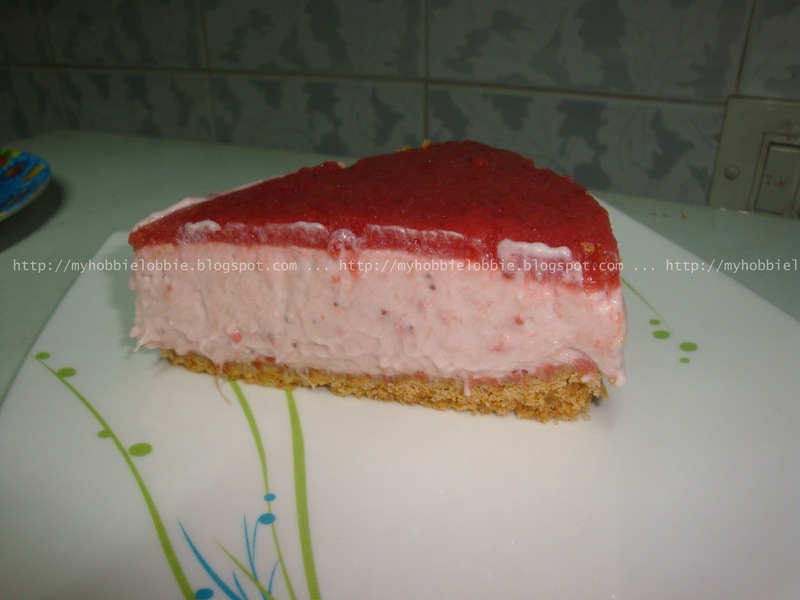 A scrumptious, really easy to make, no bake strawberry cheesecake. I happened to have some frozen strawberries, that I was really looking forward to using to make something really nice. I had used a few in the past to make some strawberry lassi, but I wanted to make something else as well. 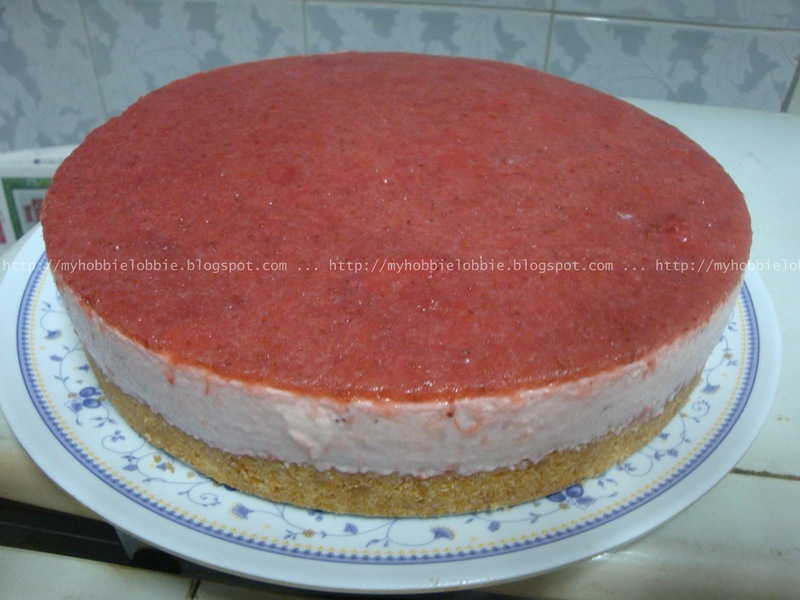 I've always wanted to try making a strawberry cheesecake. Way before I started this blog, my husband and I had made some delicious mango cheesecake, which I'm hoping to recreate when mangoes make their appearance next. Since then I've always wanted to be able to make a variety of good cheesecakes at home. I though it would be really cool to be able to do just that. And you know what, it really is. I had never tried making a no-bake cheesecake and I've always been really eager to see how it worked out. I must say, it was so much fun to put together. Now that I've tried one, I have so many more ideas dancing around in my head that I can't wait to try out. For now, this strawberry version is a real keeper. It was not too sweet, the texture was just perfect and the strawberry topping had just the right amount of tartness to go with the richness of the cheesecake. I really loved how this turned out. I would have loved to garnish it with beautiful, luscious, fresh strawberries, but considering how the strawberry season ended months ago that was not possible. But that doesn't take away from the cake at all. I'm so pleased I decided to try this out. Pretty as a picture, I think. Crush the biscuits to fine crumbs. Add the melted butter and mix well till it resembles wet sand. Press this down evenly and firmly in an 8 or 9" loose bottomed / springform pan. Place the strawberries, sugar and water in a saucepan and cook over medium heat till the strawberries are quite soft. Puree the fruit either using an immersion blender or a regular blender. Sprinkle the gelatin over 2 tbsp cold water in a small bowl and let it sit for about 2 minutes. Transfer the gelatin and the strawberry puree back to the saucepan and gently cook over low heat, whisking just until the gelatin is fully dissolved. Take off heat. Reserve 3/4 cup for the topping. Beat the cream cheese and sugar till smooth. Add the vanilla extract and the strawberry topping except the 3/4 cup you've set aside for the topping. In a separate bowl whisk the cream till medium peaks form. Fold this into the cheesecake batter gently, until it is all combined. Let it sit, uncovered in the refrigerator for about 2 hours or until it feels set to the touch. Place the cheesecake back in the refrigerator and allow it to set for about 30 minutes, uncovered, or till the topping has set well. It is ready to serve, or you can cover it with some cling film and leave it refrigerated for a day or two. Before unmoulding the cheesecake, run a knife around the edge of the cheesecake to loosen it up. Topping it with fresh strawberries would be a great way to finish it off. Sounds so good. Wish I had a fork to dig in to that slice. It was really good Barbara! Thanks for stopping by! That looks really good and I love that it's no bake! Thanks Lisa, have fun with it! I've actually never made any kind of cheesecake - but no bake cheesecake really appeals to me! This came out beautifully! Wow, this turned out really beautiful! I love that it's no bake too. Win win! Thank you Katherine, Dee and Peggy! My mom loves cheesecake and she is visiting these days. This would be perfect to make for her! Thanks for sharing! Thanks for stopping by Shumaila! Which cream cheese did you use??? Grafleen I used D'lecta but u could also use Philadelphia as well. Hope u enjoy it as much as we do!